So, we got way more entries than we would have guessed! <3 We absolutely love them all Originally we had three winners, but we decided to give small prizes to best Eumi and best Iriv entries too! We wanted to do this, because the top three ended up including both characters. These entries were so close making it to the top 3 that we felt we needed to acknowledge them somehow! We based our judging on the overall feeling of the drawings, not skill level. We would say the most important traits were how well the personalities of the characters were captured, did the drawing look like some effort was put into it and did it impact us somehow. Like for example if the drawing was drawn so well, but it felt somewhat "soulless". We would prefer the one that made us feel something. We will feature all the entries in our favourite folders on our front page! We will contact the winners personally. Soooo, here are the results! 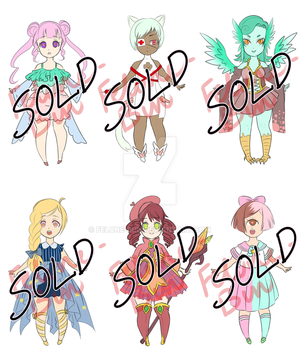 by 50USD or 5000 + full color fullbody drawing from both of us. by 25USD or 2500 + fullcolor bust drawing from both of us. This one! Ah, I really enjoy the way that the anatomy is drawn, I love the expressions & just the basic facial features, Eumi has a cute precious face with blushed cheeks & small nose (Even the teeth are there!). Iriv has a bold powerful features, MAJESTIC nose and the horns.. THE horns, aaah, I really can't probably even draw her this well myself hahhaha. & The bodytypes could not be any better & I really like the fact that Eumi looks big, like for real, is not just a lil bump:') This drawing really stands out from the others! 3rd place: by 25USD or 2500 + colored sketch( Eumi-Bun ) and sketch( Filthybites ) bust drawing from both of us. The designs! Ah I love the clothes so much <3 They represent the characters so well. I will absolutely draw Eumi wearing this! Idea is very cute and well executed. Their pirate logo is so cute. Eumi is a bit on the thin side, but the consept is really cute and the characters are looking super cute and beautiful. I love this scene! This is just the kind of thing I can see her doing, too lazy to really get up, not even going to out smoking. Her room would be that glamorous, just a room to sleep in and watch tv. Maybe plan out some stuff in her own peace. & the anatomy is great! I love that belly! This picture just really yells IRIV! to me hahhah. by 10USD or 1000 for both of them! I couldn't decide between these two... They are just so lovely! The comic captures Eumi's fashion perfectly <3 And she looks so cute in this style. Also I love how excited she is! And it is clear that a lot of effort was put in to this. THANK YOU AGAIN FOR EVERYONE WHO ENTERED!! Thank you so much!! I'm really happy you both like my illustration of your interesting characters - it was so much fun to draw them. Congrats to all the other winners, too! Oh my gosh, thank you so much! I'm so glad you liked the comic! Congrats to all the other winners! Contest WINNERS! !So, we got way more entries than we would have guessed! <3 We absolutely love them all Originally we had three winners, but we decided to give small prizes to best Eumi and best Iriv entries too!